Looking for red, white and blue recipes? These patriotic recipes are perfect recipes for Memorial day picnic or a 4th of July picnic. These red, white and blue recipes will be a hit. Here you can find recipes that are red, white and blue and are perfect for any picnic. If you are having a Memorial day picnic or a 4th of July picnic, you will seem like the best cook there. Here you can find appetizers, side dishes and desserts, all busting with flavor and style. The summer is here. That means warm weather, pool time and picnics. We spend a lot of time at picnics, and we are always looking for the next recipe we will take with us. Since 4th of July is coming up fast, we are on the lookout for recipes that feature red, white and blue. 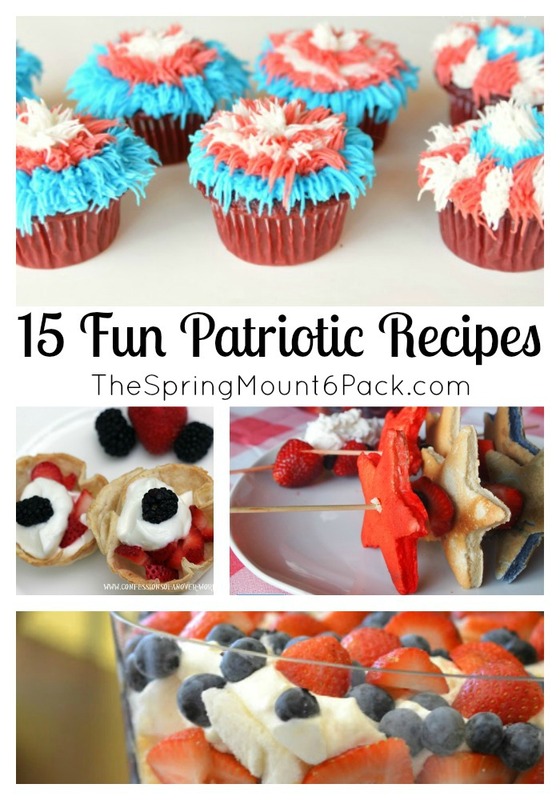 Whether you are looking for Fun Patriotic Recipes Memorial Day recipes or recipes for 4th of July, these recipes are perfect red, white and blue fun. 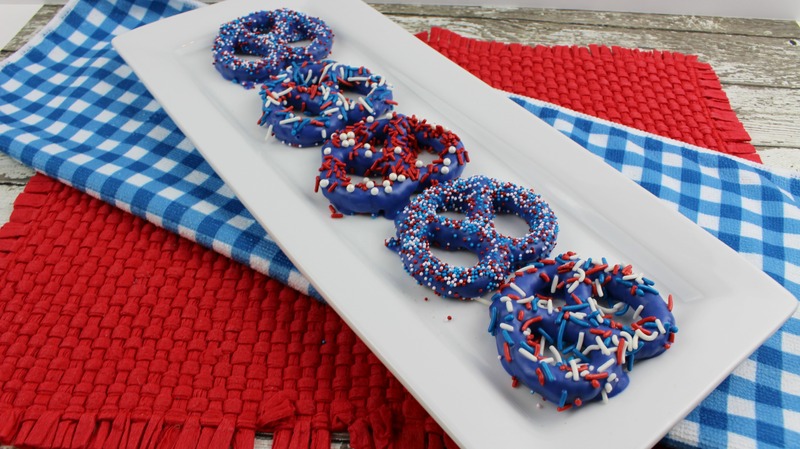 Patriotic Chocolate Covered Pretzels One of our favorite red, white and blue pretzels are always a hit. I get the kids in the kitchen with me, and I get to eat Chocolate covered pretzels. I can not believe how delicious these chocolate covered pretzels are. To get chocolate covered pretzels around here, it will run about $13.99 a pound, which only gives you a few chocolate covered pretzels. I can make a large batch for under that. Here are some great recipes that will be perfect for any picnic but even more perfect for a Memorial Day or 4th of July picnic. These recipes feature red, white and blue that will bring some patriotic fun to your picnic. Patriotic Trifle Bowl While this dessert didn’t start out as a patriotic dish; it sure looks the part and will make a great addition to your menu. Breakfast recipe for Yogurt Parfaits in Tortilla Cups Tired of cold cereal in the mornings? Here’s a different breakfast recipe to try. Red, White and Blue fireworks inspired cupcakes. These cupcakes are easy to make and will wow your guests. Fourth of July Pancakes What could be better than breakfast? This 4th of July pancakes are a great start to any morning. Red, White, & Blue Velvet Ice Cream Sandwiches I love ice cream sandwiches. Red, White and Blue Velvet Ice cream sandwiches are perfection. PATRIOTIC BERRY CUPS Celebrate the holiday with fresh fruit that will put you in the celebration mood. Red, White and Blue Fourth of July Sugar Cookie Tart Use this simple sugar cookie tart recipe that is great for celebrating the holiday. Old Glory Patriotic Cupcakes This layered red, white and blue cupcake will leave everyone wanting a cupcake. Confetti Potato Salad This potato salad adds a little extra to your picnic. Red, White, & Blue Cheesecake Stuffed Strawberries If you haven’t had one of these cheesecake stuffed strawberries, you haven’t lived. Patriotic Popcorn Crunch Recipe Popcorn is always a special treat. Now it is even better. Very, Berry Moscato, I love Moscato, so this cocktail is a no-brainer for a holiday. Red, White, and Blue Brownie Pops Love brownies? These brownies are even better. Raspberry Cream Dessert Shooters Shooters make a great dessert, and these are perfect for a red, white and blue holiday. Fourth of July Fruit Skewers are perfection all the time. It is a fun way to serve fruit during a picnic or celebration. All of these recipes will also be great for any picnic. This summer start making things a little different. These recipes will be a hit no matter when you make them. If you love having a picnic for Memorial Day or 4th of July, you will love these recipes. It is such a fun way to add some spirit to your celebrations.